The team now has 22 strategic partners and further relationships with organisations across the region. Below you can view each partnership, along with the objectives both parties in our valued partnerships wish to achieve by working together. Morgan Sindall (MS) offers national design construction and infrastructure services to private and public sector clients. They are part of the Morgan Sindall Group. The Group consists of: Overbury, Morgan Lovell, Lovell, Morgan Sindall Property Services, Muse Developments, Morgan Sindall Investments and BakerHicks. The company vision and values are at the heart of everything. They are based on the company culture, and represent both who they are and what they stand for. NTU enjoys a rewarding relationship with Morgan Sindall, exploring unique ways to support the strategic priorities of both organisations to promote talent, skills, innovation and research. Priority focus areas are currently: Teaching and Learning, Work Experience and Employment, Research and Development, Business Planning and Strategic Alignment. Morgan Sindall are keenly engaged with NTU to drive this ambition, running panel assessments, offering student placements, providing real-life project content and providing assessment insight, along with a host of other activity. Speaking at our Women in Built Environment Event, co-producing a pod-cast on “Building a Future Fit Workforce” and sponsoring an award at the 2019 Graduation Ceremony are among the highlights of the partnership. With focus on developing the workforce and encouraging innovation in the construction sector, NTU can provide an alternative approach and insight to a thriving and industry, sharing knowledge and expertise. VolkerFitzpatrick is one of the leading engineering and construction companies in the UK and provide specialist building, civil engineering and rail expertise to a range of markets to provide a truly integrated service to clients. They possess proven experience and deliver successful projects in a wide range of industries, including commercial, industrial, education, rail infrastructure and depots, airports, waste and energy. VolkerFitzpatrick is part of VolkerWessels UK, a multi-disciplinary construction and civil engineering group operating across the UK in six operating companies. VolkerFitzpatrick have had great internal, student facing presence for the past 17 years. Regularly taking part in jobs fairs, employing our graduates and providing placements for our Built Environment students, they give them a fantastic opportunity to experience compliment their studies with practical elements, while gaining a fresh prospective to the industry. The VolkerFitzpatrick vision is to collaborate effectively to create profitable, sustainable growth throughout VolkerFitzpatrick. Exploring new ways to support the strategic priorities of both organisations, the future aspirations of the partnership include working together to produce and retain talented employees while exploring diversification, social mobility and inclusivity in the workforce. This will be underpinned by VolkerFitzpatrick’s business drivers and in line with NTU’s four underpinning areas; Teaching and Learning, Work Experience and Employment, Research and Development, Business Planning and Strategic Alignment. The Creative Quarter Company (CQC) is jointly owned by NTU and Nottingham City Council. The Nottingham Creative Quarter (CQ) is an economic development initiative set up in partnership between Nottingham Trent University and Nottingham City Council. Located across the areas of Hockley, the Lace Market, Sneinton Market and Biocity in the city centre, its objective is to attract and support the growth of Nottingham’s creative and digital businesses, providing opportunity and expertise for student and graduate development. The close working relationship that has been developed with the CQ since the signing of a Strategic Partnership Agreement in 2017 has led to the creation of a targeted action plan to identify and develop employability opportunities within CQ businesses for both existing students and graduates, facilitated by a dedicated NTU business services consultant based within NTU. Other student-facing activities have included involvement within a programme of creative events, such as Nottingham Light Night, UK Young Artists Festival, public exhibitions of work and Creative Fridays at Sneinton Market. The CQ is also part of the wider Big House project, a business support programme (currently ERDF match-funded to September 2019) working with small and medium enterprises (SMEs) and entrepreneurs in creative and digital industries within Nottinghamshire and Derbyshire. Future focus centres around the continuing development and support of employability and skills; an increased visibility of the diversity of NTU activity within the CQ offer from both a student and academic perspective, and the enhancement of the profile of the CQ as the go-to body for creative business support, talent development and innovation in Nottingham. The Nottingham Post is published by MGN Ltd, part of Reach PLC. The Nottingham Post is an English tabloid newspaper which serves Nottingham, Nottinghamshire and parts of Derbyshire, Leicestershire and Lincolnshire. The Post is published between Monday and Saturday each week, and is also available via online subscription. It was formerly “Campaigning Newspaper of the Year”. Founded in 1878 as the Nottingham Evening Post, the Nottingham Post has long been acknowledged as Nottingham’s main news publication. NTU entered into a Strategic Partnership Agreement with the Nottingham Post (NP) in November 2017, when it was owned by the Trinity Mirror publishing group. The partnership comprised two main elements; a commercial focus with identified campaigns and sponsorship opportunities; and collaborative value-adding activities and opportunities for mutually beneficial engagement, aligned to the strategic pillars of developing talent, skills, innovation and research. Examples of initiatives and successes include the development of work experience, live projects and news coverage opportunities with students in the NTU Centre for Broadcasting and Journalism (CBJ); NP journalistic collaboration with Notts TV student activity; a marketing consultancy project with the Nottingham Business School (NBS); collaboration on the annual journalism awards hosted by the CBJ, and an NBS consultancy project based on Nottingham’s top 200 companies. In 2018, Nottingham Post was acquired by Reach PLC, Britain’s largest newspaper, magazine and digital publisher (comprising 150 newspaper titles and 80 websites). The future focus of activity with NP, and partnership review will also seek to identify and incorporate the wider opportunities that this recent change can facilitate, including involvement from other subject areas and schools within NTU and the interface with digital audiences and skills requirements. In September 2018, NTU signed a three-year Strategic Partnership with Nottingham Castle. The Castle is currently undergoing a £29.4million redevelopment. The partnership with NTU will see collaborations across the university’s colleges including placements, internships, live briefs, course design and delivery and the establishment of a NTU Project Lab within Castle grounds, which will focus on innovation. We are working closely with the Castle to identify areas for collaborative research, and NTU will be active partners in organising events for its reopening in 2020. Our partnership reflects NTU’s goals to create opportunity, enrich society, and value ideas. The shape of the partnership will develop and grow over time but already there are exciting ambitions that will create unique and dynamic opportunities for students, staff and local people. A historic partner with its eye firmly on the future, the Castle has plans to proactively embrace technology. The Castle is working with Professor Mohamed Gamal Abdelmonem on scanning the site and exploring areas for collaborative research. NTU are at the early stages of setting up a working group to research new ways of using technology to develop audiences and this partnership will lead the way. It will also provide a platform for research into work force development in the Museums and Heritage Sector. NTU and Nottingham Contemporary have been working together since the Contemporary’s inception in 2008. This productive, mutually beneficial partnership has supported a dynamic, inter-disciplinary public programme and has created opportunities for staff and students and local, national and international audiences. The structure for the partnership is based on three priorities: developing people, solving challenges and other specific matters such as developing and delivering co-branding initiatives. Current activity with the Contemporary includes: an extensive number of students working on internships, placements and live briefs across the three schools of Art & Design, Arts and Humanities and the School of Social Sciences; collaborating with the British Council by funding two professional development opportunities in the Venice Biennial 2019; one PhD project; and one Arts and Humanities Research Council (AHRC) networking grant. The direction of the partnership will head more towards being research intensive, with a focus on further PhD candidates and projects, as well as further cultural collaborations such as the CAMPUS independent study programme. NTU and the Nottingham Playhouse have a mutually beneficial partnership, which helps benefit not only students, staff and academics, but has a wider reaching community impact too. The efforts of both institutes adds to the rich and varied cultural experiences that are available in the City. The Partnership has agreed to collaborate on the following areas: developing people, solving challenges and enriching society. Recent activity has had a focus around diversity within the sector, both in terms of engaging a broad range of students to consider careers in the arts and wider creative industries as well as how to attract more diverse audiences to the Playhouse. This has been supported by work based learning opportunities in a wide range of disciplines including arts, design, business, social sciences, technical production and data analytics as well as live briefs and voluntary opportunities. NTU also sponsor a production at the Playhouse, this year being ‘One Night in Miami’, and work in partnership to offer the Playhouse Prize to one talented student. Future collaborative work will continue making the arts accessible to all and providing real world experience on productions. This will allow NTU to continue providing industry-ready graduates. NTU and the Playhouse will also work in partnership on exciting research projects, such as exploring low carbon and sustainability research. Nottingham City & Nottingham UNESCO City of Literature (NUCoL) are working together to: support the NTU Cultural ambitions; to create opportunities for students in terms of placements, live briefs, contributions to teaching and volunteering; to co-develop research opportunities and to co brand and co-promote activity. The partnership between NUCoL and NTU is built on collaboration and co-creation. Current activity includes: the first NTU writer in residence programme, a distinguished lecture series including talks from Chris Riddell and Val McDermid, Re:Vision workshops in Krakow, Ljubljana and Dublin, live project briefs for students (such as the young poets video series and Grads4Nottm), internship programmes and a M4C (Midlands 4 Cities) placement: poetry pulse with Becky Cullen. Future developments include exploring and cementing international relationships through the wider UNESCO network. We will examine research projects that will connect with other cities of literature and their cultures, partnering with other cities of literature on combined areas of interest such as animation as well as international work experience opportunities for students, for example participating in the International Book Fair held in Granada. The Partnership focuses on providing industry ready graduates, that can make immediate positive impact at AECOM, through Degree Apprenticeships and recruiting NTU graduates to graduate level roles. AECOM benefit from having direct access to NTU students through activities such as Grads4Nottm, students project showcases, and placements and graduate recruitment workshops. In turn NTU students and academics AECOM and NTU also collaborate to drive innovation that supports AECOM’s ambition to remain efficient in its delivery of services, create sustainable physical environments and social infrastructure to advance economic opportunity, and deliver services faster, smarter and better. Specific, current areas of focus include research and knowledge exchange that informs rapid structural assessment; materials optimisations; real-time data automation; NTU Smart Campus Strategy; market intelligence planning; mobile application design and development. The Partnership leverages Fujitsu’s ecosystem approach that aims to make a positive impact to people and wider society through strategic partnerships. The Partnership significantly and positively addresses some of the issues and challenges customers, employees and students face, through a number of wellbeing and safety projects under a shared approach and strapline Co-Creation: helping to unlock creativity, knowledge and innovation. A specific co-creation project already underway between Fujitsu and NTU is the co-development of a simple mobile app solution called BuddyConnect, which is focused on helping employees plan and manage the mental health challenges autism may present in the workplace. Additionally, Fujitsu is committing significant expertise and effort to support 150 NTU Engineering students as part of the Grand Challenge 2019, which encompasses a number of workshops, consultancy and guidance exercises, culminating the winning students being presented with an award and the opportunity to showcase their results at the Fujitsu World Tour 2019. Thought leadership activities aim to address a number of wide scale challenges that includes improving UK public sector efficiencies; reducing suicide on transport networks; and making Nottingham City and the University campus smarter. NTU’s relationship with Siemens aims to address modern skills and innovation challenges to enable Siemens to remain competitive through advances in the digitalisation space, providing key skills and thinking to improve efficiencies in manufacturing and maximising servitisation opportunities across the business. NTU’s Data Analytics Degree Apprenticeship provides critical skills and diversifies Siemens access to new talent. In addition to data science skills, both parties are exploring novel ways to develop control and automation skills for Siemens and the wider supply chain. In April 2019, a Siemens-NTU funded PhD Sponsorship will spend time in Siemens’ Energy Management business and with NTU’s Science and Technology, and Art, Design and Built Environment schools on research in to optimising district heating. Additional research activities will support healthy ageing challenges using smart meters and combined data analysis and machine learning, and Nottingham Smart City ambitions. East Midlands Ambulance Service (EMAS) have been strategic partners since 2017. EMAS and NTU has worked on co-developing and co-delivering a range of professional accredited education to support the recruitment and development of EMAS Staff. The developments to date have been included developing new Ambulance Medical Technician Courses alongside Ambulance driving courses. The partners are working to identify innovative areas of research to support service delivery and patient care. There is work underway to develop further professional training and development to support staff career development and recruitment and retention of staff working for EMAS. This will include further accredited courses to broaden the career development framework. There will be a focus on joint research opportunities, to develop innovative ways to improve patient care. Alongside the Partnership and system will work in partnership to develop new roles in response to local health and social care needs. Nottingham University Hospital Trust have been a strategic partner since 2015. The strategic focus of the partnership has been developing and co-delivering Continuing Professional Development Frameworks for Nursing, including specialist modules and a leading and innovating nursing degree. The developments to date have been in response to needs identified by the Trust in specific services. Work is underway to design and deliver apprenticeships in partnership including the Associate Nurse Apprenticeship. The range of specialist modules continues to expand in response to the Trust identified priorities, with work underway to expand the career development framework across multi-professional boundaries and to encompass a wider range of staff. The partners are working together and with the wider system to develop new roles in response to local health and social care needs. NUH and NTU are working together to identify innovative ways to raise awareness of students and graduates to explore careers in health. The partnership is exploring wider partnership opportunities around research projects and innovative ways to improve patient care. Nottinghamshire Healthcare NHS Foundation Trust has been a strategic partner since 2016, There have been a range of evaluations undertaken with the Trust with NTU Academics, including the evaluation of a bespoke development programme for middle management. There have been placements and internships that have been extremely successful in a small range of areas. The partnership has successfully crated joint funding bids to develop innovative partnership work to support the work of the local health and social care system. The Partnership is working on developing new and innovative roles, which are reflective of the needs of the service users and patients and which will have system applicability. Alongside the organisations are working in partnership to develop a framework for continuing professional development for the Trust reflecting key priorities for staff and patients. The partnership are seeing to increase the breadth of placements and internships at the Trust as one of the ways to raise awareness of students and graduates about exciting careers in health. In addition, there is further evaluation work planned for distinct programmes of work to support how initiatives are embedded and to identify whether there is a need for associated staff development and training as an enabler. There is work as a Trust and as part of the systems to design new roles and innovative ways to access those roles in conjunction with increasing placements and developing research opportunities. BioCity Group provides incubation space for life science companies offering managed lab, office and meeting space to tenants. It also provide business training and events and maintain an investment portfolio. NTU are a major shareholder in the BioCity group and we are working together to enrich the life science ecosystem both within BioCity for its business tenants and more widely for the D2N2 region as a whole. By building on the life science heritage of the east midlands and increasing the attractiveness for businesses to locate in our region we create work opportunities for our students, both as undergraduates and as graduates, and strengthen the collaborative research potential. BioCity are partners in the new Medical Technology Innovation Facilities that NTU are building at Clifton Campus and on the Boots Enterprise Zone. The facility will accelerate the development of MedTec and dovetail into the incubaton space available at BioCity and Medicity. NTU host joint events aimed at raising the awareness of the talent and resources available within NTU, which can give support to the work of SME companies, whilst delivering on our student learning enrichment aims and skills development. We currently have MSc students undertaking a yearlong project focused on life science sustainability and academic research into the regional impact of the Biotech industry. Founded in 1963 by Molly Badham and Natalie Evans, Twycross Zoo (TZ) is a registered charity which exists to support conservation, education and research of some of the most endangered species on the planet. TZ is an award-winning conservation charity that funds and conducts scientific research, attracting 500k+ visitors per year, including 60k education visits experiencing our award-winning education and outreach programmes. TZ is home to one of the largest primate collections in Europe and the only place in the UK, and one of four worldwide, where visitors can see all four types of great ape (gorilla, orang utan, chimpanzee and bonobo). Animal welfare, conservation of species and environment, and widening participation in STEM activity is the focus of the partnership between NTU and Twycross Zoo. The current and planned collaborative work in these areas is providing wide-ranging opportunities for joint research in animal and social sciences, enriching our student learning experience through projects and placements, and knowledge exchange with reciprocal guest lectures and curriculum input. Examples of some of the exciting partnership activity underway include a student team project aimed at using heritage funding to completely regenerate and enhance the Twycross Zoo nature reserve for community engagement. Placements of veterinary Nursing students at the Zoo. Nutritional analysis research and the creation of a browse grove to provide animal feed and native species conservation work. NTU and Browne Jacobson LLP are partnering across a variety of different activities with a particular focus on workforce development and employee wellbeing. The partnership aims to provide colleagues at Browne Jacobson with the key leadership and technical skills to continue to deliver as top national law firm renowned for exceptional client service. NTU and Browne Jacobson also aspire to develop industry leading insight into the unique health and wellbeing challenges posed by the law sector to help foster both a physically fit and emotional resilient workforce to cope with the demands of modern life. Freeths LLP are a fast growing top 50 full service national commercial law firm with close to 1,000 employees. NTU and Freeths became strategic partners in 2019 aiming to expand our collaboration having already enjoyed strong relationships together for many years. NTU is aiming to work closely with Freeths to fully understand the threats and opportunities associated with ‘Lawtech’ both in terms of embedding teaching within the curriculum and also utilising NTU’s expertise to develop innovations in AI, machine learning and data analytics. Potter Clarkson is an award-winning, top-tier firm of European patent and trade mark attorneys and intellectual property lawyers, and one of the largest full service IP practices in Europe. NTU and Potter Clarkson are working together utilising one another’s expertise to help shape future investment and innovation in Medical Technologies at the University. A future projects portfolio is planned using students from across various disciplines at the University to undertake market research in support of Potter Clarkson’s strategy for growth. Refinitiv are one of the world’s largest financial technology and data organisations and became strategic partners with NTU in 2018. NTU are supporting Refinitiv to grow their Nottingham national technology centre and build their talent pipeline. Refinitiv colleagues are gaining exposure to students by imparting their knowledge through delivering a comprehensive programme of industry-led lectures and offering practical work experience opportunities targeted at both widening participation students and ‘Women in Tech’. The future scope of activities between NTU and Refinitiv is expected to include a focus on project management, to explore collaborative research projects and the introduction of new investment banking software. Santander Universities has been a key partner to NTU since 2012 and the partnership has gone from strength-to strength in this time. 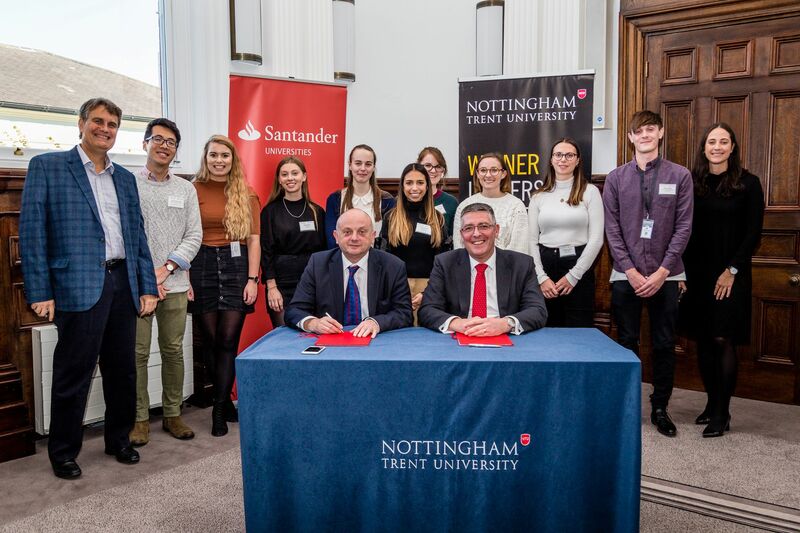 Santander have provided funding opportunities for hundreds of NTU students to gain valuable work experience and to drive enterprise benefitting both the local and wider regional economy, but also internationally in addition. NTU and Santander now collaborate on a number of different fronts from technological innovation to workforce skills development. The next phase of the partnership ‘Vision 2020’ has a strong focus on delivering opportunities for widening participation or economically disadvantaged students to help further level the graduate level employability playing field.